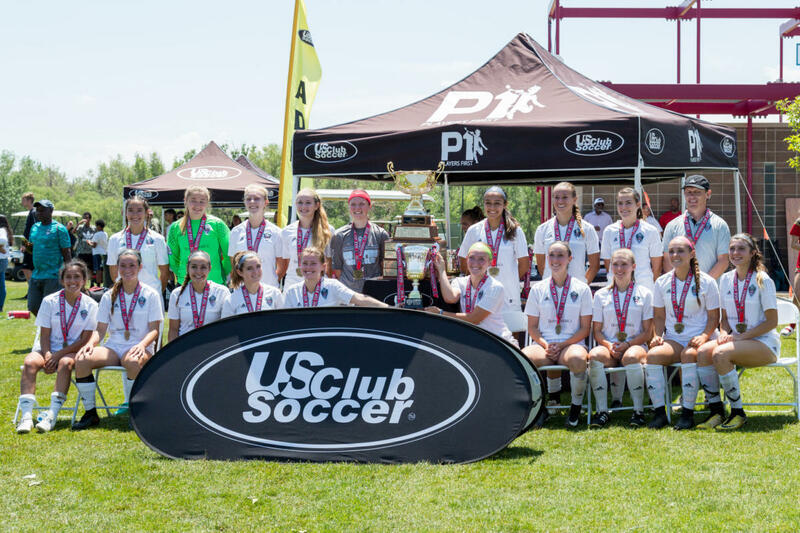 00Gs Win the National Cup XVII Finals! In their second group match, the 00’s beat The Dynamos from Houston, TX which put the 00’s at the top of Group B. 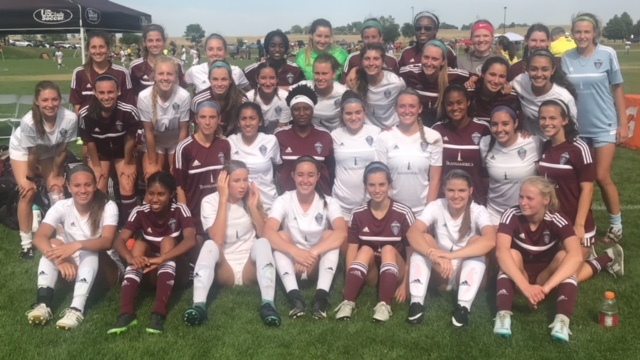 Needing only a tie in their final group-play match to advance to the national championship final, the 00’s shut out B’Elite Chaos from New Jersey to win Group B with a perfect 3-0 record. In group play the 00 Girls achieved three shut outs while putting 14 goals past their opposition. Every group-play match was very tightly contested in the first half, however, Denver’s altitude and very hot temperatures proved to be too much for other teams. The majority of goals scored by the 00’s came in the second half as opposing teams wilted in the altitude and heat. In the weeks leading to nationals, the 00’s trained hard four to five times per week in the heat of the day. By the time the 00’s arrived in Denver they were healthy, fit, and very sharp physically and mentally. They were very well prepared to handle the altitude and the heat, and as a result, were able to wear down and outlast their opponents. In the national championship final the 00’s faced a very big, strong, and physical team from Oklahoma, TSCH Bolding ’99/’00. The first ten minutes of the game was very fast-paced and back and forth as the 00’s and TSCH put heavy pressure on each other. In the 11th minute the 00’s opened the scoring with a great goal off the left side. Five minutes later TSCH equalized against the run of play when an 00 clearance ricocheted off of a TSCH striker and into the goal. This was the first goal the 00’s had given up in the tournament. The 00’s responded very well by scoring a second goal in the 22nd minute, then again in the 35th minute to end the first half up 3-1. In the second half, TSCH came out strong and scored on a corner kick in the 51st minute to bring the score to 3-2. The match was hard-fought and tight for the next 22 minutes. The score stayed at 3-2 until the 73rd minute when the 00’s scored to make it 4-2. TSCH began to push numbers forward, but like the other teams they could not sustain their energy and became stretched. The 00’s stayed strong and put the game away in the 82nd minute with their final goal en route to a 5-2 final victory. At the final whistle the team rushed the field and fell into a pile as they celebrated their victory. The 00’s then received their trophy and medals in a ceremony that was supposed to take place on a giant stage, but a strong micro-blast storm the night before destroyed the stage. That didn’t bother the girls, though, as they finally enjoyed the payoff for their intense hard work and preparation. This is only the second time in Rio’s history that a girls’ team has won a national championship. Congratulations again to the 00 Girls!!! Congratulations 00’s, Well done ladies, and coaches, That was a great job! Proud to be part of the Rio family. Very nice!